It runs on your own server - keeping your data under your control at all times. EASWeb works with any EAS suite application. 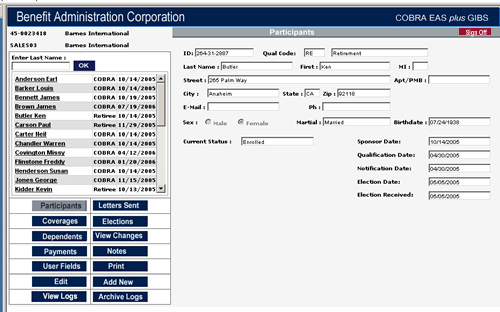 Division level allows authorized parties to add new records, view all current data and request data edits. Plan participants can view their own personal, dependent, coverage, billings/payments, letters sent and other data or request an edit. Administrator level allows the user to modify setup selections and review on-going log files. 2. Your plan participants can manage benefits from anywhere at any time. All they need is an internet connection and a web browser. 1. Employee self service reduces your administration costs and frees you to concentrate on other tasks. You can easily customize the interface to include your own graphics, text, and logo, maintaining the same look and feel of your current company image. 4. Your data is always under your control on your own server. Setting up EASWeb on your server is easy. Just follow the illustrated system setup instruction guides to install the required files. Most installations can be completed in less than 2 hours. the exchange of data between your company, divisions, participants and any other entities to which you grant access. 3. Full electronic functionality handles all aspects from initial new entry to carrier eligibility reporting. 5. Fully supported by the highly trained specialists at BPSC.